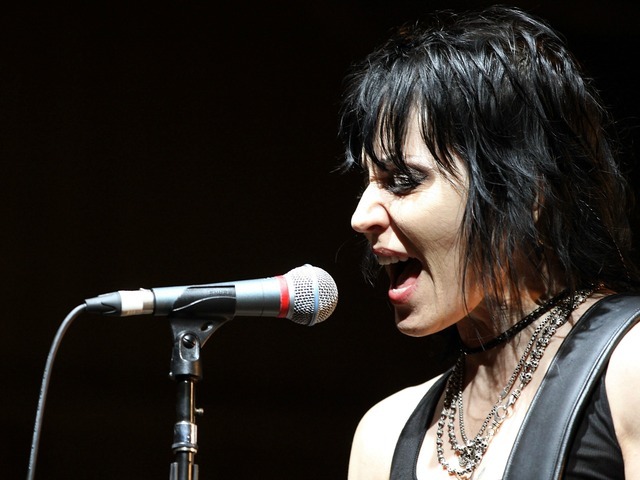 Joan Jett performed a free concert at the Newcastle Casino on Sept. 26. A huge crowd was already gathered when the gates opened at 6 p.m.
Around 7 p.m., a local band called “Midnight Revival” gave an hour-long performance to keep fans entertained until Jett’s arrival. After much anticipation, Joan Jett and the Blackhearts finally took center stage at 8:30 p.m. sharp. Jett said one of the songs, “Make it Back,” was written in honor of several tragic events that have recently happened in the U.S.
“We saw all the tornado damage as we were coming in to Oklahoma,” she said. The remainder of the concert was a mix between The Runaways songs as well as new and old songs from Jett’s solo work. Just before the encore, Jett finally broke out the few classic songs she is most known for. All who had been sitting down were instantly on their feet as “I Love Rock n’ Roll” was performed. Fists in the air, the crowd sang along to all the lyrics and sang even louder as the spotlights were turned on to the audience who was urged by Jett to sing the chorus. After thanking the crowd for coming out and heading backstage, Jett returned a few minutes later for a three-song encore. There was a sense of euphoria in the audience as Jett struck the last few chords of her guitar. Jett’s voice throughout the performance sounded just as clear and strong as it was during her days with The Runaways. The only downside was the length of the performance, which lasted just over an hour. Overall, it was a cheap and fun way to spend the night with my friend, do some people watching and rock out to some good music. For a free concert, I can’t complain.